What is the training/racing philosophy of your kennel? To get a winning team! Happy dogs that run because they love it. I believe that a dog that is healthy, well fed, trained for their task and well taken care of will also perform at its best. All our training is done with positive reinforcements and never asking for more than what the dogs can do. Do you have specific training goals for your team(s)? Summer conditioning is done on a walker. That keeps the dogs in fairly good shape during the off season. 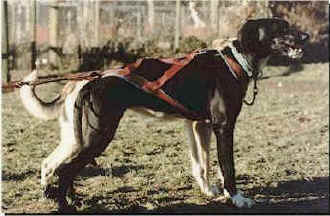 The dogs are walking until the end of September and by then they have about 250 kilometers on the walker. By the time we start taking them out with the 4-wheeler they are pretty well muscled and conditioned. This makes the tough 4-wheel training a lot easier on their bodies. October and the two first weeks of November I train with the 4-wheeler. Usually we don�t do more than 12 kilometers on gravel before we go on snow with sled. Before the racing season starts in January I like to have a few long (35 kilometers) runs with the team to see how they react on the distance. of the 1998 ONAC How do you choose which races to enter? We try to do one or two local races in the beginning of the season for the yearlings to get a feel of racing before we go to the main races. After that we go for the big ones. I have one main race every season that I try to peak for. Good dogs and to be prepared on all levels. Best training, best feeding, best care, best equipment and all of the thousands of little details that can make a big difference when it all has to come together on one weekend. A good economy and lots of hard work. There are no shortcuts to victory! What is your vision of the future of sled dog sports? I am only 28 years old so I hope I will be around when the sleddog sport becomes a member of the Olympic family. That I think would be a big thing for our sport. I also hope that in the future it would be easier and cheaper for mushers to travel back and forth between Europe and North America. What can individual mushers do to support and promote the sport? Be a good representative of our sport on races and at home. Take care of your dogs and treat them good so that people from outside get a good view of our sport. 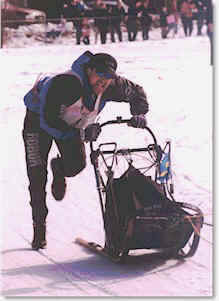 As a dog musher you are always an ambassador of the sleddog sport! What part do clubs and organizations play in sport development? Clubs play an important role in our sport to organize races and events and teach junior mushers about mushing. The international politics also are important factors, but that I leave to my wife, who is in the council of the IFSS board. For me the 1998 Open North American was a long time dream come true. This was the race that I had been reading all about and following closely every year for as long as I can remember. I didn�t know what to expect from trail conditions, longer distances and the new competition. Before the race I had hopes for placing among the top 8 teams and I knew this was possible if I didn�t make too many mistakes. I knew the dogs would do fine but I needed more experience myself and I also got it! 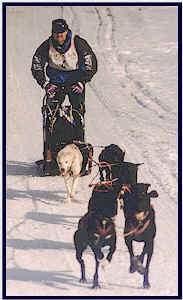 3rd day 1998 ONAC The biggest difference of racing in Alaska compared to Europe are the trails. 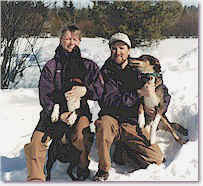 Our trails in Europe are often hilly and have looser snow which makes it fairly heavy for the dogs. The dogs have to pull hard all the time. What I realized when I got to Alaska on those extremely hard trails was that I had to try and teach the dogs to run without pulling. The trails where so hard that there was no resistance from the sled like we are used to. When I took my foot off the ground and started pedaling, my dogs seemed to lose their balance and tried running faster and faster to feel the pull in their lines. This way it was hard for me to get a nice, easy rhythm in the team. But we learned a lot and will be trying new things for next year and hopefully improve our results.